With a stay at Four Points by Sheraton Perth, you'll be centrally located in Perth, steps from RAC Arena and within a 10-minute walk of His Majesty's Theatre. 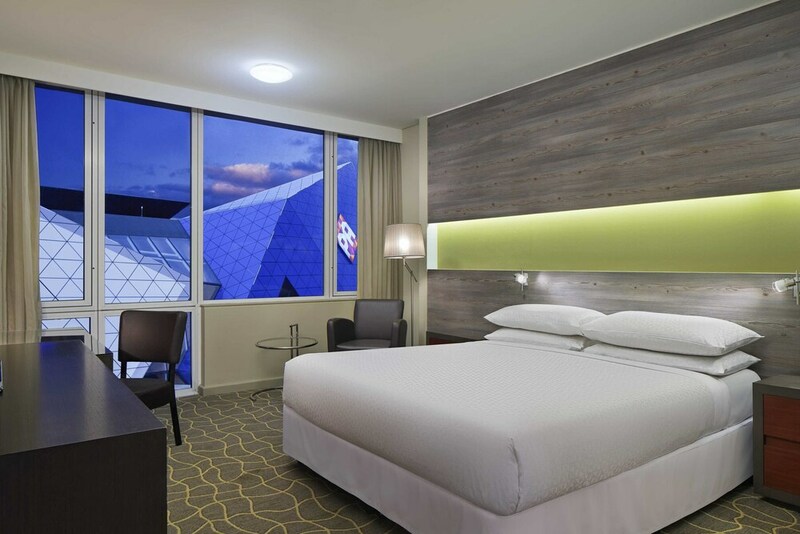 This 4.5-star hotel is 0.8 mi (1.3 km) from Perth Convention Exhibition Centre (PCEC) and 0.9 mi (1.4 km) from Yagan Square. Make yourself at home in one of the 278 air-conditioned rooms featuring refrigerators and flat-screen televisions. Complimentary wireless Internet access keeps you connected, and cable programming is available for your entertainment. Private bathrooms with showers feature complimentary toiletries and hair dryers. Conveniences include phones, as well as safes and desks. Take advantage of recreation opportunities such as a fitness center, or other amenities including complimentary wireless Internet access and concierge services. Additional amenities at this hotel include wedding services and a ballroom. Enjoy international cuisine at The Eatery, one of the hotel's 2 restaurants, or stay in and take advantage of the room service (during limited hours). Wrap up your day with a drink at the bar/lounge. Buffet breakfasts are served on weekdays from 6:00 AM to 10:00 AM and on weekends from 6:30 AM to 10:30 AM for a fee. Featured amenities include a 24-hour business center, express check-out, and complimentary newspapers in the lobby. Planning an event in Perth? This hotel has facilities measuring 4541 square feet (422 square meters), including conference space. Dining is available at one of the hotel's 2 restaurants. The property also offers a snack bar/deli. A bar/lounge is on site where guests can unwind with a drink. This 4.5-star property offers access to a 24-hour business center. A computer station is located on site and wireless Internet access is complimentary. Event facilities measuring 4541 square feet (422 square meters) include conference space. This business-friendly hotel also offers a fitness center, concierge services, and complimentary newspapers in the lobby. Four Points by Sheraton Perth is a smoke-free property. Buffet breakfasts are available for a surcharge on weekdays between 6:00 AM and 10:00 AM and on weekends between 6:30 AM and 10:30 AM. The Eatery - This restaurant specializes in international cuisine and serves breakfast only. Open daily. The Best Brew Bar - This restaurant specializes in international cuisine and serves lunch and dinner. Guests can order drinks at the bar and enjoy alfresco dining (weather permitting). A children's menu is available. Happy hour is offered. Open daily.